“Parmigiana” with Aubergine, Parmesan and Tomato Sauce is a fantastic main dish, cooked all over Italy and can be an excellent vegetarian main course. This is one of the classic preparations of southern Italy, associated with Naples’s cousine, but it is popular in Calabria and Sicily too. The dish is pretty simple even though the prep is slightly long: we have a sliced filling made of aubergine pan fried in oil, layered with tomato sauce and cheese, and baked into the oven. In many versions, the sliced aubergines are first dipped in beaten eggs and then in flour or breadcrumbs before being fried. Some recipes use Parmigiano, while others use softer melting cheeses like mozzarella, or a mix of both! Jeanne Carola Francesconi, connoisseur of Neapolitan cuisine and famous recipe author, argues that the origins of the recipe can be dating back more than two centuries ago. She finds in the works of V.Corrado I.Cavalcanti the first attempts to explain the recipe that we now know as the parmigiana today. The aubergine is a plant native to Asia, was probably introduced into Europe by Arab traders during the late Middle Ages. Like other plant belonging to the nightshade family has long been accompanied by bad name. For this reason, its spread in Europe began only in the eighteenth century, during which begins to become common in the canteens of the people first and then the nobility. An important clue to identify the moment in which the recipe began to take shape, is identifiable in the presence of an important ingredient which is the tomato, the fact that in certain extent certifies the origin of the eighteenth century. Although this vegetable, imported in Europe only with the discovery of the Americas, followed the same fate of eggplant, finally he succeeded to establish itself in European ostaria only in the eighteenth century. These observations support the thesis that the emergence of the parmigiana is to be placed between the second half of the eighteenth and the first decades of the nineteenth century. But the first mention for this dish can be found in Il saporetto by Simone Prudenzani (1387-1440), where the recipe refers to “parmisciana.” The eighteenth-century Neapolitan chef Vincenzo Corrado in his book Il cuoco galante published in 1786 maintains that to cook melanzane alla Parmegiana means that the aubergines will be seasoned with butter, herbs, cinnamon and other spices and grated parmigiano cheese. In the end he suggests to cover with a cream sauce made with egg yolks before being oven-baked. - Heat oven to 200C/fan 180C/gas 6. - In a shallow pan, mix together the garlic and 4 tbsp of the olive oil. - Make your tomato sauce in the usual way. Cook over a high heat for 3 mins, tip in the tomatoes, then simmer for 8 mins, stirring every now and then and adding salt, pepper and the basil towards the end. - Slice the aubergines about 1cm (1/2 inch) thick. Dust the slices on both sides with flour. - Beat the eggs, season with salt, and dip the floured aubergine slices into this. - Fry the aubergine slices three or four times in some hot oil. Brown on both sides, remove and drain on kitchen paper. 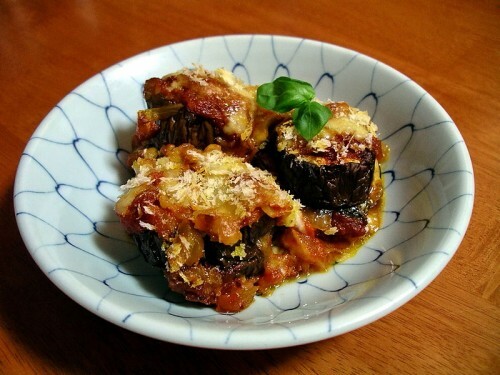 - When all the aubergines are cooked, lay a few of them in the bottom of an ovenproof dish. - Put two or three spoonfuls of tomato sauce in the bottom of a large ovenproof dish, then arrange a layer of the aubergine slices, placed as close together as possible. - Add seasoning, then repeat this process with the remaining ingredients creating layers. Finally, sprinkle over a little more Parmesan, then bake for 20 mins or until the topping is golden. This entry was posted on Saturday, October 10th, 2015 at 11:38 am	and is filed under Italian Recipes and Food. You can follow any responses to this entry through the RSS 2.0 feed. You can leave a response, or trackback from your own site.